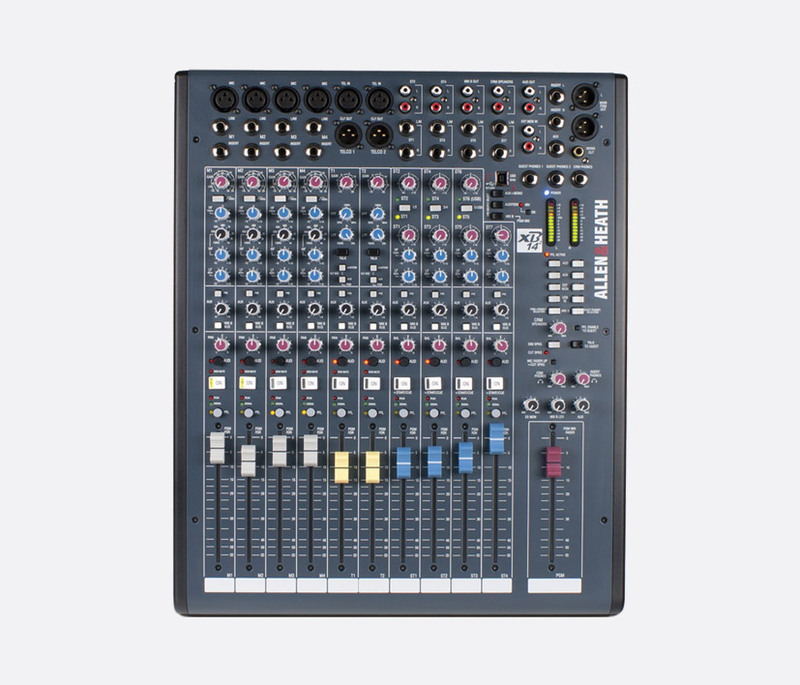 A range of small-footprint, self-operated or producer-operated, broadcast mixing desks with telephone input channels, the XB series offers XLR microphone inputs, stereo channels, microphone channel switch-sensing and USB connectivity for audio routing. USB connections are 1.1 compliant, 16-bit at 32, 44.1, or 48kHz. A compact ten-input broadcast mixer designed for small radio or internet broadcast studios. Three microphone/line channels have balanced mono XLR inputs for the microphones, -10 to -60dBu nominal, +11dBu maximum and 6.35mm, three-pole jack sockets for line inputs, +10 to -40dBu nominal, +30dBu maximum and use low-noise transistor circuitry based on the MixWizard series mixers. A switched limiter/soft-knee compressor with LED indicator to help control the input signal level, high-pass filters are provided to cut low-frequency noise. A dedicated telephone input channel with a clean feed return output which can be sent from the main mix or' using an auxiliary mix, can be operated off-air by depressing the talk button. Note that the telephone channel should not be connected to a phone line, an interface is required, see Telephone balance units. Three-band equalisation with mid-sweep on the mono input channels, and two-band equalisation on the telephone and three stereo channels gives the user control over varied input sources, while a variable limiter option on the electronically balanced XLR outputs, +4dBu nominal, +25dBu maximum, can be selected to standardise the final mix output. All channels have rotary gain controls, rotary level controls for the auxiliary mix which may be switched between pre and post the main level control, rotary pan or balance controls, pre-fade listen buttons, rotary level controls and large illuminated 'ON' switches. Two headphone outputs are provided, one for the operator output, one for a guest. Each is fed by a rotary volume control which adjusts the level of the chosen monitoring sources, selected by a row of push buttons which can be used to select a mix of the available sources. The guest output has the choices 'Monitor in', 'Aux', 'USB in', 'PGM', so may be fed from a bespoke mix via the auxiliary mixing bus. The operator has the choices 'Monitor in', 'Aux', 'USB in', 'PGM', 'ALT'. 'ALT' is a mono mix of the channels where the 'ON' switch is in the up position, where the level is set by the channel fine gain controls. A 25-way D-sub connector allows remote control over external equipment by using the 'ON' switch logic on the microphone and telephone channels, and the start and cue logic outputs on the stereo channels can remotely control playback hardware such as CD players. Power source: 100-240V AC, 47-63Hz 22W. Dimensions: 336 x 275 x 95 (w x d x h)mm. Weight: 3.4kg. 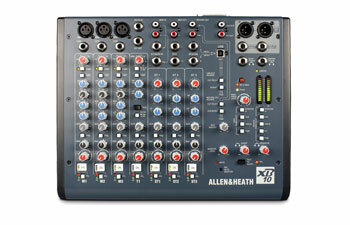 This is a dedicated, self-operated or producer-operated, broadcast, mixing console with four microphone/line channels, two telephone channels and four stereo line channels.Using a two-stage pre-amplifier design for a gain range of 69dB, along with 100mm faders gives better control for varied input sources. As this is a sophisticated design, it is strongly recommended that the user guide is inspected closely before purchase. The microphone/line channels are mono, with balanced XLR connections, +6 to -63dBu nominal, +17dBu maximum, for the microphones and 6.35mm jack sockets, balanced, +10 to -26dBu, +30dBu maximum for the line inputs. The two dedicated telephone channels have XLR input connectors, balanced, +10 to -26dBu nominal, +30dBu maximum and balanced XLR clean-feed outputs. A 'talk' switch with a pre-selectable mono channel as the source (mono channel 1 as factory default), gives the operator an option to communicate with the caller with the fader down so that the presenter's voice isn't sent to the programme mix output. They have variable-frequency high and low-pass filters and two buttons select the source sent to the 'CLF OUT' XLR connectors to send cue to the remote caller. These buttons giving a choice of the main programme or the auxiliary or the audition mixes as the source, in each case without the contribution from the remote caller. 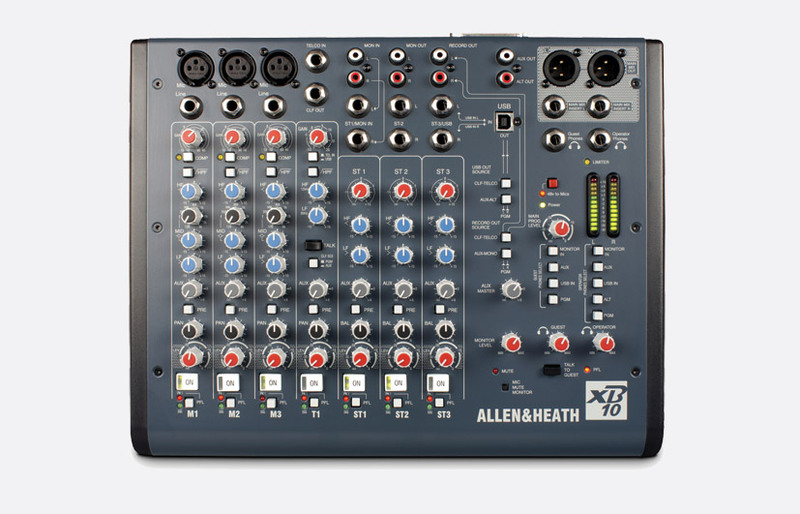 This sophisticated system uses six separate mixing busbars, according to the Allen & Heath user guide, rather than the much cheaper mix-minus method. Note that the telephone channels should not be connected to a phone line, an interface is required, see Telephone balance units. There are four stereo channel strips. Two of them a have dual inputs consisting of a pair of 6.35mm unbalanced jack sockets, and a pair of RCA (phono) sockets. Both pairs are unbalanced, 0dBu nominal, Off to +10dBu. The third is also dual input, it has the jack sockets, with the alternative input fed from the USB interface. The fourth has a single pair of jacks. Dual input channels have push switches with indicator LEDs to select between inputs; all the stereo inputs have gain adjust controls. All input channels have audition buttons giving a post fade mix by switching from programme bus to audition bus for off-air recording. Mono mic/line channels have a 100Hz high pass filter and 3-band EQ with mid-sweep, stereo input channels have 2-band EQ. Main programme mix insert points are available via 6.35mm unbalanced send/return jack sockets. The electronically balanced main program mix outputs, +4 nominal, +25dBu maximum, are controlled by a single 100mm fader, and have 3-pin XLR connectors. Three headphone outputs are provided, one operator output and two guest outputs, all with 6.35mm 3-pole jack sockets. Two RCA(phono) sockets provide outputs to feed control room speakers via an amplifier. Three rotary controls adjust the volume for the operator, guest headphones and the speakers. There are two columns of five latching push switches, one for the control room speakers and operator headphones, one for the guest headphones, corresponding to the following sources: Audition, auxiliary, external monitor input, USB input and Mix B. The first set select the signal source for the control room speakers, headphones monitor and the meters. They work on a priority basis. If they are all up then the post-fade main programme signals will feed the monitor circuit. If any of the switches are pressed then the programme signal will be replaced. If more than one switch is pressed the switch nearest the meters will take priority. The PFL signal will override the selection to the meters and control room if activated. The second set operate in a similar fashion to control the source feeding the guest headphones. However The PFL signal will not be fed to the guest phones outputs unless a switch is pressed. This is an 'under-panel' switch so it cannot be operated accidentally. A 'talk to guest' button can be used for off air conversation. Three connectors on the rear panel allow remote control over external equipment. A 15-way D-sub socket 'Remote A' is used for fader-up logic and external mute control; a second 15-way D-Sub plug connector 'Remote B' can be used for start/stop/cue pulses; a 9-way D-sub socket can be connected to external metering equipment, using line-level, analogue signals. Power source: 100-240V AC, 47-63Hz 30W. Dimensions: 385 x 465 x 103 (w x d x h)mm; Weight: 3.4kg. These mixers are clearly designed to appeal to international users and have some features which may be alien to UK broadcasters. A detailed inspection of the user guide will indicate how the designers have tried to appeal to all. For example, the channel on/off switches can be disabled on the XB-14-2, to appeal to traditional UK broadcasters who wish to fade the input on and off, rather than the US style where pressing a button was once the norm. Unfortunately for some, there is no switch to reverse the direction of the faders.